Self-drive Pénichette for from 4 to 6 people. The Pénichette 1120 R is comfortable to welcome 2 couples or a small family. - Two large opening roofs. Couple discount: - 10% discount for 1 couple on board. Offer valid for every booking. Family discount: 10% discount when there is one child under 18 on board. Loyalty discount. : 3% from the second reservation; 5% from the third (may be combined with other offers). Combining discounts. : Discounts can be added together up to a maximum of 20%. Flotilla discount: 5% for any simultaneous booking of 2 boats minimum . Fuel: Liter/hour: 4.0 - The hourly rate is displayed in all the bases. 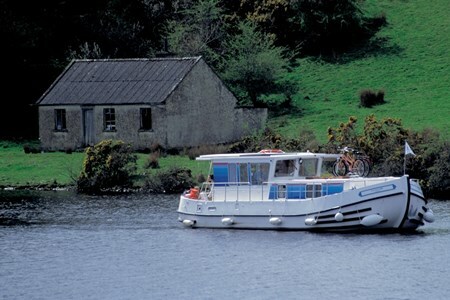 As an illustration, the daily price varies from €20 to €35, depending on the type of boat and the price of diesel. Almost each base owns one private car park or garage. Taxi transfer on your arrival or on your return day: between 75€ and 430€ depending on distance.